Hiking or backpacking is a wonderful way to find some time to yourself or spend time with some friends. If you are like most of us, you still need to use your smartphone or laptop when you are out enjoying nature. An excellent way to keep your electronics charged when out in the wilderness is to use a lightweight portable solar panel charger. Many of these kits are small and compact. 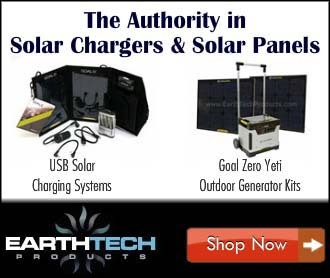 They offer a very effective way to harness the energy of the sun to efficiently charge your electronics of choice. Let’s look at some options to keep your laptop, tablet, smartphone or video camera charged with the power of the sun. The X-Dragon solar panel charger is a nice compact and portable solar charger. Weighing in at just 1.15 pounds, it folds up slim and will fit in any backpack. When you are ready to charge, just unfold the panels and place in full sun. You can also clip the panel right to your backpack and charge your battery bank or electronics on the trail. This solar charger is designed for high efficiency. It can capture more sun than most panels which requires less charging time. The X-Dragon comes with 2 USB ports so this solar panel charger is powerful enough to charge an iPhone and iPad mini at the same time. It can also adjust the voltage to obtain maximum efficiency during charging. The panels are quite durable and will last for many years. 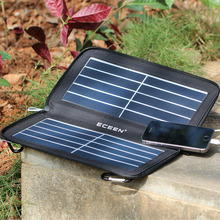 The ECEEN Solar Panel Charger is a lighter weight panel systems than the X-Dragon. It weighs in at only 0.8 pounds and will only charge one device at a time. This charger is ideal for hikers that are more space and weight conscious. It has a 10-watt capacity and has 2 panels that zip up into a slim pack. It also comes with a convenient side pocket for your phone and charging cable. This system will charge just about any USB phone or device with 5 volts. It also pairs well with a power bank. This solar charger is great value for the money and comes in camouflage too. The SunJack 7W Solar Charger is a great lightweight, durable and weather resistant solar panel charging system. It comes with a 4000mAh power bank that can be fully charged in about 5 hours. The included power bank can fully charge two smartphones. The power bank also has a handy built-in flashlight. The solar panel can also power and charge most of your USB electronics directly. Just like the other panels, it will produce a 5-volt charge. You can also link 2 panels together using a special USB Y-connector. This will increase your amp output from 2.1 amps to 4.2 amps. This is great if your fellow hikers have one because you can link your panels together to increase your charging capabilities. This lightweight portable solar panel is extremely useful for traveling and backpacking. All of these lightweight portable solar panel chargers are great for hiking, camping or general travel. If you are unable to plug in your electronics into a power outlet then these panels can be a life saver. So get off the grid and live the solar life. Here at Sustainably Solar we talk about all things solar. Solar technology is a wonderful way to cut your electricity bill and charge your electronics. Solar power has now become a viable way to have the sun provide reliable energy. Our goal is to offer product recommendations and tips on how to live the solar life. All the information on this website is published in good faith and for general information purpose only. www.sustainablysolar.com does not make any warranties about the completeness, reliability and accuracy of this information. Any action you take upon the information you find on this website is strictly at your own risk. www.sustainablysolar.com will not be liable for any losses and/or damages in connection with the use of our website.